It is classic that political liberals, spelled with a D, have the most distorted notions about income, wealth, and the so-called wealth gap we are all hearing so much about. This great and evil divide must be the mark of the devil in America, the great satin in the minds of many. These distorted notions reign supreme among letter writers to the USA Today as illustrated in today’s paper, January 28, 2015. Today’s letters are republished below for the benefit of discerning readers. This published idiocy will be addressed here one piece at a time, in so far at that is possible. Income versus wealth: The first idiocy is the USA Today’s inability to differentiate between income and wealth. Differentiate means an ability to separate the wheat from the chaff. Income and wealth are vastly separate entities. The evil 1% refers almost exclusively to income, most of whom pay huge sums in taxes to our governments every year. This amounts to biting the evil hands that feed the governments and the poor!! Tax day in the media shows those who pay taxes based on their income and how much. The pie graph below shows that the top 1% pays 29% of federal individual income taxes. These evil folks are doing far more than their fair share of paying taxes. 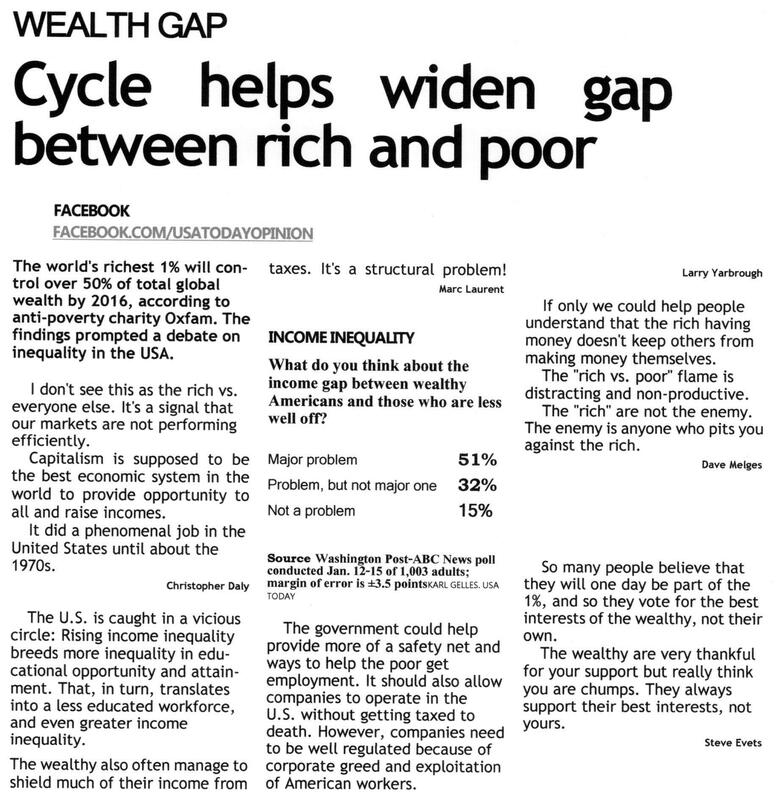 Quoting from the paper, the top 40% income earners pay 95% of such taxes. Said another way, this same 40% pays $19.00 in taxes for every $1.00 paid by the other 60% of tax payers. To Romney’s chagrin, the famous 47% of our population pays no taxes at all, and many receive a government handout of some variety. These evil income earners should be identified as clearly as possible. According to the 2012 census, Income inequality in the United States, households in the top 20% had two or more income earners and combined incomes in excess of $91,705. Households in the middle 20% mostly had one income earner per household and had incomes between $36,000 and $57,607. Households in the lowest 20% had incomes less than $19,178 and the majority of these households had no income earner at all. Surprise! Surprise! Those folks who come from the top 20% of America’s households do so in the most amazing way; they have two or more income earners. The middle income households, also known as America’s middle class, have one income earner. The bottom income households had under $20,000 income, and most had no income earner at all. It follows that if you want to get ahead in America, most folks go to work. Work is the magic elixir by which the greedy households survive and get ahead in our society, pay taxes, and live the good life. On Capitalism: Christopher Daly’s letter on capitalism explains the gap between the rich versus everyone else as a failure of capitalism. It worked fine, he says, until about 1970. One may presume this was at about the same time that he started working, and then it stopped working. I guess the whole system is now simply a failure. He may have missed reports of Steve Jobs, Bill Gates, Mark Zuckerberg, the Koch Brothers, and the thousands of others who have built empires in our broken capitalist system. One must be a democrat to believe the system no longer works. The wealthy are cheaters: According to Laurent the wealthy are cheaters. If this were true, then why do they continue to pay the lion’s share of taxes? The top 40% pays 95% of individual income taxes. This distortion of reality is pure fantasy, the kind that democrats love. Less educated workforce: Laurent’s less educated workforce leads to greater income inequality! A true democrat believes that everyone who works should earn a living wage for himself and a family of four. This explains the focus on the minimum wage as the safety net for the middle class. The middle class earns well above the minimum wage, which is essentially a starting wage for folks who have limited skills and little to offer employers. Is doing well an incentive? Steve Evets’ thoughts may be the most interesting. He states that voting with the 1% is not in an individual’s interests. If an opportunity to get ahead through one’s own effort is not in one’s own interest, then what is the incentive; for everybody to be equal? Equality is a fantasy born on some other planet, not among humans on earth. Some do well and others don’t. Some work and others don’t. Some do well in education and others don’t. Some learn to get ahead in a competitive society and others don’t. Government responsibility: Given the great differences in folks’ ability and willingness to work hard to get ahead, should the government be the agent that provides equality in outcomes for all folks? The Russians, Chinese, and North Koreans all support this government responsibility. South Korea’s example is the antidote to equality. Given their freedom, which the United States helped preserve, they became a shining example of capitalism. Photographs from satellites of North and South Korea provide a clear example of this freedom. South Korea is lit up like a Christmas tree, while North Korea is invisible from the air, ‘cause there is little electricity to be seen from space. Prescription for all Americans: The paper From poverty to wealth offers a prescription for all those folks who believe that opportunity in America is dead. This pure baloney comes from those who are interested in winning elections, not in getting ahead in America. Getting ahead in America is a life-long challenge that requires discipline and persistent hard work. For those who follow this prescription America is the greatest land of opportunity on earth. The vast majority of folks refuse to follow, or are unable to follow this prescription, and unfortunately they tend to blame the system rather than accept individual responsibility for the outcome. What is self-serving is to blame others, or the “system” for one’s own short comings. A few are left behind not of their choosing. Most who are left behind had many choices along the way. They refused to make the choices required to get ahead.